E-Motio Flexible bus concept developed by Motio (part of the case study 3) | J. Ricardo Mejía S.
Modular, smart and electric – these are the three key elements of a new bus design that the Dutch design studio Motio created. This studio is specialised in creating products for the mobility market, in the past they did design work for MAN and Solaris. The theme of the E-Motio bus design is “made to measure”. Each bus is based on a separate front and rear section, of which one is fitted with the driveline. 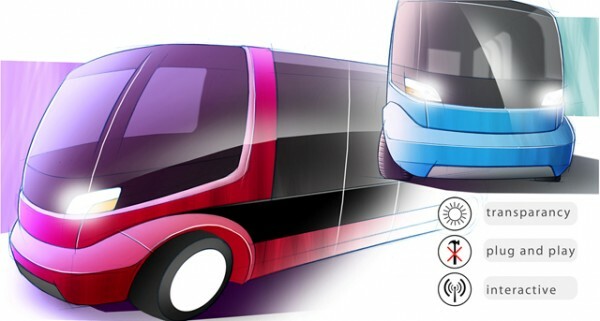 Between these elements can be fitted to create a bus with exactly the capacity which is needed in a certain situation. E-Motio buses can be delivered in lengths which offer space for ten up to seventy passengers. Scale models of the E-Motio concept will be exhibited at the Busworld exhibition 2009 in Kortrijk. My dear friend, designer, even more: industrial designer!. In this exercise you overdid your design skills. Even you have made use of one of the principles of the digital media!, that one of the variable, finally seems to be that though our paths divert our concepts converge. You in clean and comfortable devices and products; me in noisy and dirty machines, isn’t it Indeed great?. A fat hug from Manizales.